A few weeks ago, not long before announcing Sean Williams of El Primer Mundo as the new Cohiba brand ambassador, General Cigar Co. revealed Cohiba Blue. From a packaging perspective, the new line is a departure from the silvers and blacks that dominate the rest of the Dominican-based brand’s portfolio. I don’t know this for sure, but my sense is the Cohiba marketing team was aiming for a differentiated look that expressed modernity and approachability. The purpose of Cohiba Blue, after all, seems to be to attract more (presumably younger) consumers to the brand at a less intimidating price point. The four inaugural vitolas that are just now arriving at retailers nationwide—Churchill (7.5 x 50), Robusto (5.5 x 50), Rothschild (4.5 x 50), and Toro (6 x 54)—sell in the $8.99 to 10.99 range. While they are by no means discount or value smokes, they are less expensive than many of the other options within the Cohiba collection. Each vitola is presented in a box of 20 that’s hand-painted—you guessed it—bright blue. 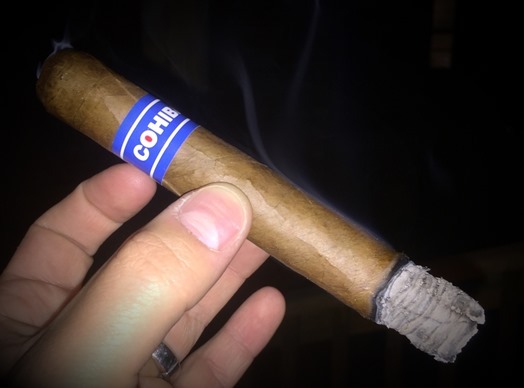 I smoked a handful of Cohiba Blue Robustos for this review. Appearance-wise, this cigar is unimpressive. The OSA wrapper is grayish and pale with several prominent veins that leave the splotchy, moderately oily surface rugged and unrefined. And the band seems quite cheap—not because it’s blue, but because it’s flat and plain. Looks are far from the most important aspects of any cigar. So I went into lighting up my first Robusto with an open mind. What I found was a well-balanced, spice-forward, medium-bodied profile that’s best characterized by cinnamon, cedar, roasted nuts, warm tobacco, and a bit of honey. From the outset, both the draw is a bit tight and the smoke production at bit light. After half an inch, the draw opens considerably, the smoke production becomes more in line with expectations, and the spice recedes. The cedar becomes oak and the cinnamon is replaced by a sweet, creamy backdrop akin to nougat. Thereafter, there are few changes, save for a slight increase in intensity in the final third. Throughout, the burn line is well-behaved, though don’t be surprised if you need to employ a few torch touch-ups. All things considered, the Blue Robusto is a satisfying, well-made smoke with good flavors. I don’t think it’s going to wow anyone, yet there’s still a lot to like about this new Cohiba. In my book, it earns a solid rating of three and a half stogies out of five.